Chlosyne gorgone? 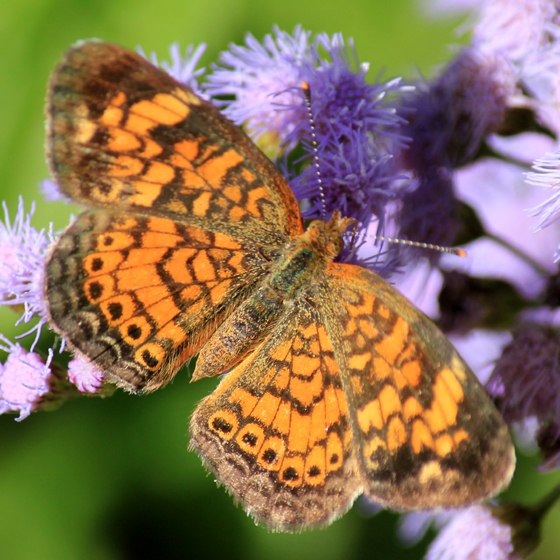 Or Phyciodes tharos? Or P. campestris? Phyciodes tharos from, for example, Chlosyne gorgone?? P. tharos as well as some other Crescents have the outer spot either hollow or broken at the trailing edge of the forewing. C. gorgone as well as other Checkerspots have an intact spot. C. gorgone has several arrow shaped spots on both wings and usually one or two white / silvered centers of the hindwing submarginal spot band. Other differences exist but these are a few basic characteristics. Thanks for taking the time to respond, Cliff. I really appreciate that!